Remote access modem offer significant cost savings and reduce network downtimes by eliminating the need to dispatch personnel to remote sites to reconfigure alarm and control systems, phone switches, diagnostic ports, remote access servers, and supervisory channels. 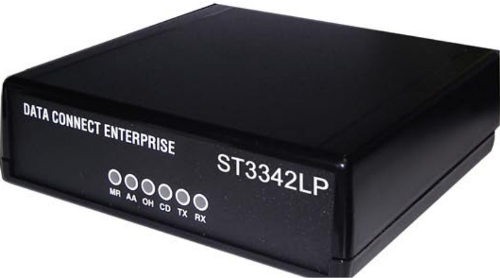 However, these benefits come with the risk that unauthorized access to remote facilities could disrupt your network and cripple your business operation with the Data Connect ST3342LP+ Series family of remote access modems, it is no longer necessary to accept the security risk associated with unprotected remote access installations. Data Connect ‘s ST3342LP+ series provides the full range of advanced modem features found in our series ST3342LP family, combined with a comprehensive set of security and access control features. The ST3342LP+ Series implements the full range of security features defined in the Bellcore Local Access and Requirements (LSSGR) in a cost effective industrial package. If you are managing highly secure remote access points, The ST3342LP+ series modems offer the most advanced security features available. Now you can access remote configuration, diagnostic, console ports, and supervisory and control channels over secure connections. With the ST3342LP+ Series, password protection, the cornerstone of most security strategies, can augment with a wide range of feature options. These features can be used to implement the multi-faceted type of access control recommended by most security experts. In addition, a comprehensive audit trial provides a historical view of access attempts, allowing your security personnel to identify “at risk” facilities. User ID/Password-Capable of storing as many as 400 passwords can be configured to operate with or without a password prompt. Retry Limits-Designed to foil the conventional trial and error approach to unauthorized access. Caller ID Verification-The Caller ID feature requires that caller’s telephone number present in the modem’s database. Non-registered numbers will not receive modem supervision. Automatic Call Back-Is configured to initiate a call back to a users modem, insuring that access is originated from known terminal or locations. Password Aging –Insures that passwords are changed on a specified schedule. Audit Trial with Precision Time Keeping-With the audit trial facilities, there is never a question about who has gained access or who has tried to gain access of your installation. All attempts to access a ST3342LP+ series device are stored in a nonvolatile audit trail along with the date and time. Remote Configuration– The remote configuration facilities of ST3342LP+ Series modem will allow you to remotely maintain passwords, review the audit trial or modify any parameter of the device. Additional configuration commands allow you to select DTE bit rate, character length and parity. Remote configuration access may be restricted to specific passwords. This optional software automates audit trial data collection and simplifies password management for large, distributed networks. Standard AT compatible dial commands or DTR dial of stored number. Standard auto answer or manual answer under DTE control. 2-wire, pulse or DTMF dial. Standard S1900 Rack mount unit automatically adjust to 85-265VAC, 27-440Hz. Optional 48VDC supply.